The holiday season is supposed to be merry and bright, but due to the high cost of the holidays and the interpersonal politics of things like gift-giving, shopping, and entertaining, it can also be filled with friction between friends and long-distance besties. A 2018 Bankrate survey found that more than two in five Americans feel pressured to reach deeper into their wallets than they're comfortable with during the holiday season. With that in mind, here are a few tips to help manage the pressure and stress of the holidays so you can actually enjoy the festivities sans drama. It's so easy when you go into a store to waste a ton of time shopping and blow your budget on a gift that costs more than you wanted to spend. This year, instead of getting friends another scented candle or bottle of wine, I'm giving money with Zelle because it's a guaranteed way to stick to my budget and never overspend. A 2018 survey by Zelle found that 58 percent of people surveyed wanted to receive money as a gift. And really, who wouldn't want a little more money going into the new year? I like to personalize every gift, so whether it's going old-school with a hand-written card or adding "for that pumpkin spice latte I know you love" in the memo line when I send $15 to a friend, I know I'm staying on track with my budget and giving a personalized gift that people actually want. No re-gifting, no shopping, and no worries. Everyone loves a great holiday party, but going out to the bars or hosting a group dinner can be beyond expensive. Instead, you can team up with friends to host a higher quality party without going broke. Not everyone is a planner though, so let everyone take on the responsibilities that best suit them — maybe your friend makes a mean margarita but can't cook to save his life, and maybe your friend with more money than time just wants to cover the cost of the cleaning service the next day. You can hire anyone from a cleaner to a bartender on sites like TaskRabbit. Figure out who wants to do what, and delegate the responsibility wherever you can! Holiday travel can get expensive quickly, especially if you're traveling with a group. Plane tickets add up fast, and it can be hard to get everyone in the same place. To sidestep this, always hunt for holiday travel deals. Websites like Hipmunk or KAYAK search multiple airline and travel sites at once, making sure you're getting the best deal on all your holiday travel. Be careful of fares that might have hidden fees, though — lots of airlines have "basic economy" tickets now that don't allow carry-ons or for you to choose your seats, and the last thing you want is to end up having to spread your friends out across an airplane. Sharing an Airbnb or vacation rental with friends can be fun, but settling up the expenses can be awkward and potentially ruin the memories you make. Instead of constantly passing money around throughout the trip, let one person put the cost of the group's lodgings or airfare on their travel rewards card and then split the costs. Point-chasers will rejoice and the money will be in their bank account before their credit card bill is due. Plus, you'll all save on ATM fees if you're in towns where your bank doesn't have a branch. I use Zelle for this, too. 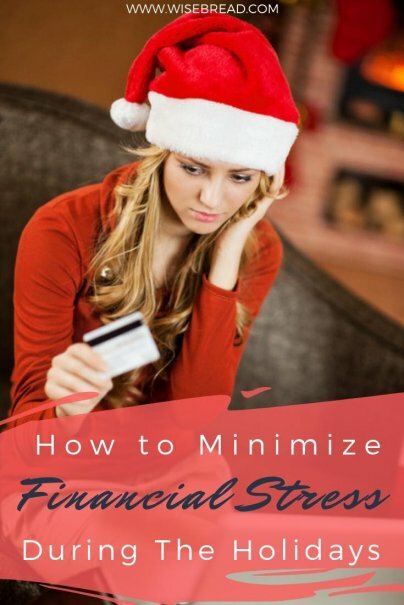 As you're looking for ways to make it through the holiday season with your sanity and finances intact, don't forget that the new year is coming up. Before you blow through your holiday budget and dip into other accounts, come up with a spending plan now to set your finances up for success in 2019. Essentials: This should be 70 percent of your overall monthly budget for basic expenses, like rent or mortgage, utilities, food, transportation, and insurance. Endgame: This should be 15 percent of your monthly budget for your future, like savings accounts, investment accounts, and retirement accounts. Extras: This should be the other 15 percent of your monthly budget for whatever else makes you happy. Set this budget before the new year begins and use whatever tools work for you to track your spending, and then set regular check-ins to make sure you're staying on track throughout the new year.